PUEBLO, Colo. – Threatening weather didn’t deter a team of six Colorado Parks and Wildlife biologists as they fanned out last week across 850 acres of Gary and Georgia Walker’s cattle ranch in Pueblo County to distribute plague vaccine hidden inside peanut butter pellets. Several of the biologists walked miles of transects across active prairie dog colonies where black-footed ferrets have been reintroduced, hand-tossing a pellet every eight yards, while a couple rode ATVs equipped with mechanical pellet shooters. Following precise routes, each biologist dropped about 50 pellets per acre across the colonies on the working cattle ranch that sprawls across U.S. Highway 50 west of Pueblo. 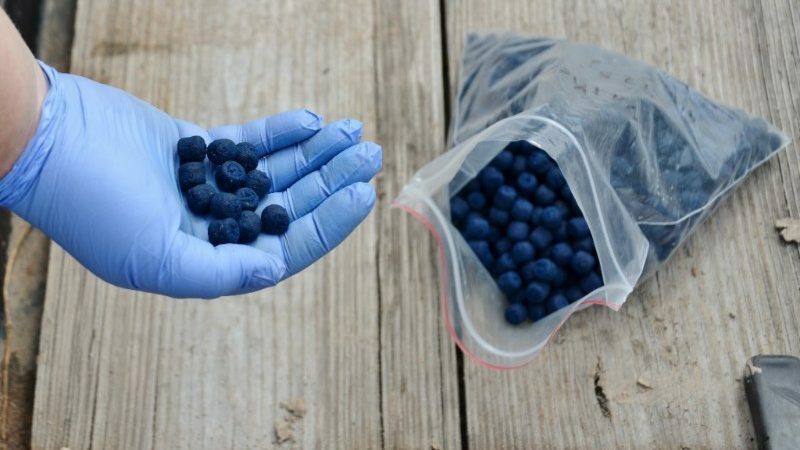 The pellets resemble blueberries and are manufactured in a CPW lab in Fort Collins. The vaccine pellets are meant to be eaten by black-tailed prairie dogs and other small mammals that call the colonies home and will provide them with a resistance to the plague virus. After two days on the Walker Ranch, the team headed for Holly, in far eastern Colorado, to spread more vaccine across more sprawling prairie dog colonies. This is in addition to the other vaccine deployment locations across the state, all sharing the aim of protecting and preserving prairie dogs in Colorado. Why go to such extremes? Because prairie dogs are incredibly important to the ecosystem. Prairie dogs create habitat for other species, such as endangered black-footed ferrets and burrowing owls. And they are critical to the diets of many animals, including the ferrets, raptors, coyotes, bobcats and rattlesnakes. Healthy prairie dog populations are essential to the persistence of black-footed ferrets, whose primary prey is the prairie dog,” said Ed Schmal, CPW wildlife biologist who was overseeing the Walker Ranch plague vaccine work. “When prairie dog populations crash, like when plague hits a dog town, ferrets take the hit too. If you want to reintroduce ferrets, it is essential to do plague management in those areas. But the work would not have been possible without the cooperation of conservation-minded citizens like the Walkers, who were the first ranchers in Colorado to choose to allow the reintroduction of black-footed ferrets – the rarest mammals in North America – on their land. We need 2,000 acres of black-tailed prairie dog colonies to consider a property as an appropriate place to reintroduce black-footed ferrets and Walker Ranch was ready for the challenge, Schmal said. We’re lucky to have partners like Gary and Georgia Walker to help us protect these endangered species, this work cannot happen without ranchers like the Walkers.